It’s difficult to imagine anyone but Citroen coming up with a car like the C4 Cactus. Known for their somewhat crazy but often thoroughly inspired designs, Citroen’s Cactus was unveiled first as a concept at the Geneva motor show. What caught many industry watchers off guard, however, was the unveiling of the production version just a few short months later, looking for all the world almost exactly like the concept. I assure you, the car you’re looking at here is the production version, but if you don’t believe me, stroll down to your nearest Citroen dealer and take a look for yourself. 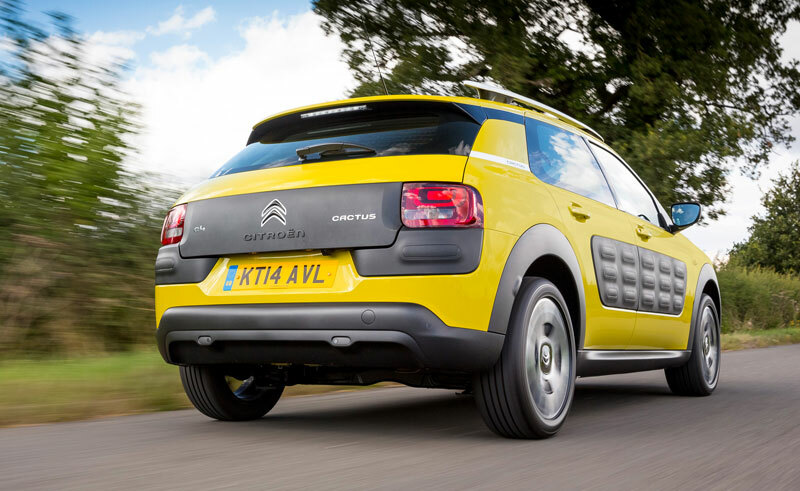 Citroen’s aim for the Cactus was to produce a car that takes the hassle out of modern-day motoring, offering not just a strong sense of design as demanded by today’s switched-on buyers, but also greater comfort, more useful technology and a low cost of ownership. Nowhere is that theme more evident than with the exterior styling. Citroen have blended the stance and ride height of a crossover with the practical shape of a hatchback, but the design itself is remarkably simple, with clean lines and smooth surfaces punctured by interesting details. The most notable of which are the padded panels on the sides, dubbed Airbump. These air-filled capsules protect the car from the annoying dents and scrapes that seem inevitable in supermarket car parks, and we understand they can be easily changed by your dealer should they become damaged or, indeed, if you fancy a different look. They’re available in four different shades – black, grey, chocolate and dune – and in combinations to match each of the ten exterior colours. 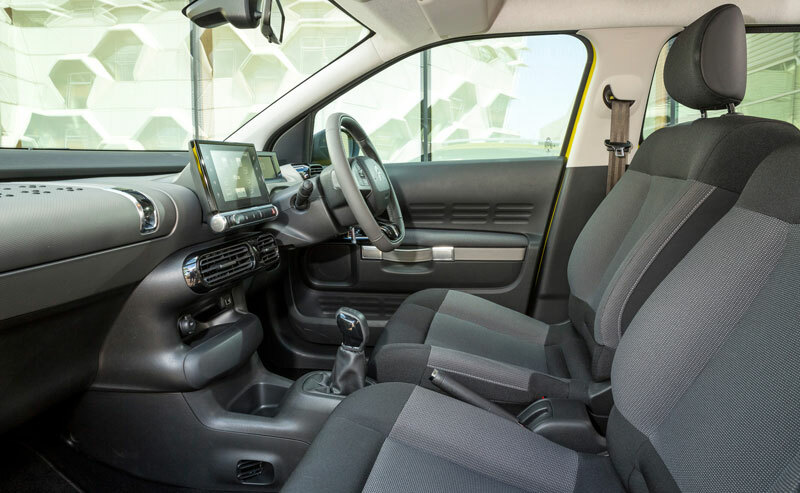 Further customisation arrives in the guise of four colours for the trim on the C-pillars, a choice of five wheel designs, plus the option of a large panoramic sunroof that uses a special UV-coating to prevent heat build-up and, Citroen says, does away with the need for a sun blind. The weight-saving measures continue with some of the engineering choices made for the car, such as the use of fold-out rather than wind-down rear windows, plus new washer jets integrated into the wiper blades that use less water, allowing the Cactus to have a smaller (and therefore lighter) reservoir. So effective are these measures that the lightest model in the Cactus range weighs in at a positively anorexic 965kg, 200kg less than a regular C4 model. This minimalist approach continues into the interior, where it’s mixed with a travel-inspired design theme. That means door handles that look like leather luggage straps while the dash-top storage compartment is reminiscent of a small suitcase. This clutter-free design lends the cabin a bright and airy feel, and there are six interior themes to choose from, each of which offers an almost complete absence of buttons. 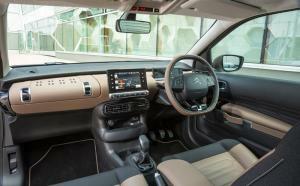 That’s largely because most of the car’s functions are controlled by a seven-inch colour touch-screen perched on top of the dash, and as standard it offers DAB digital radio, a reversing camera, a clever cruise control function with speed limiter, plus the option of satellite navigation. Everything is generally easy to fathom, although we would still have liked dedicated climate controls. Changing temperature or redirecting airflow requires that you navigate away from, say, the map screen to the climate screen and back again, and that can feel a little long-winded if all you wanted was 18 degrees instead of 19. The instrument cluster, too, is now entirely digital, although we found the red lettering to be hard to read while wearing sunglasses, and the absence of a rev counter seems like taking the minimalist theme a touch too far. 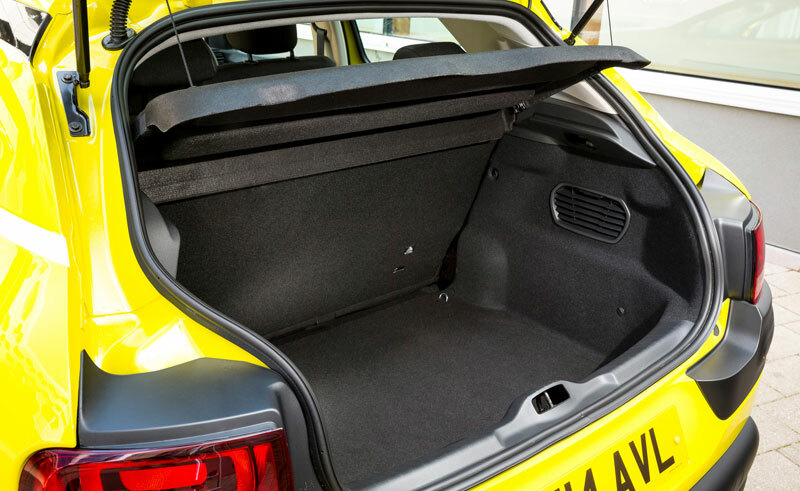 The rear seats can accommodate three adults fairly comfortably, and they can be folded forward to increase cargo space from 358 litres to 1,170 litres, although it should be noted the seats don’t fold flat. The Cactus is available with a choice of five engines, starting with a trio of 1.2-litre three-cylinder units with 75, 82, or 110hp, plus a pair of 1.6-litre diesels with 92 or 100hp. Transmissions are five-speed manuals as standard except for the 92hp diesel which is mated exclusively to Citroen’s six-speed ETG unit, with the five-speed version available as an option on the 82hp petrol model. All have usefully low CO2 emissions, the 100hp diesel taking the crown with just 82 g/km and truly incredible economy of 91.1 mpg. The quickest model in the range, the 110hp petrol, tackles the 0-62mph sprint in 9.3 seconds, but even it has impressive emissions of just 107 g/km and economy of 60.1 mpg. On the road, the Cactus offers a thoroughly relaxing driving experience. The diesel models are perhaps a little more laid-back, their torquey power delivery giving them a low-revving easy-going gait that you can’t help falling into, while the PureTech petrol units need a little more revving to get the best out of them. They make an appealing off-beat noise when they do, though, and for every-day driving we suspect the 82hp unit is more than enough for most people. 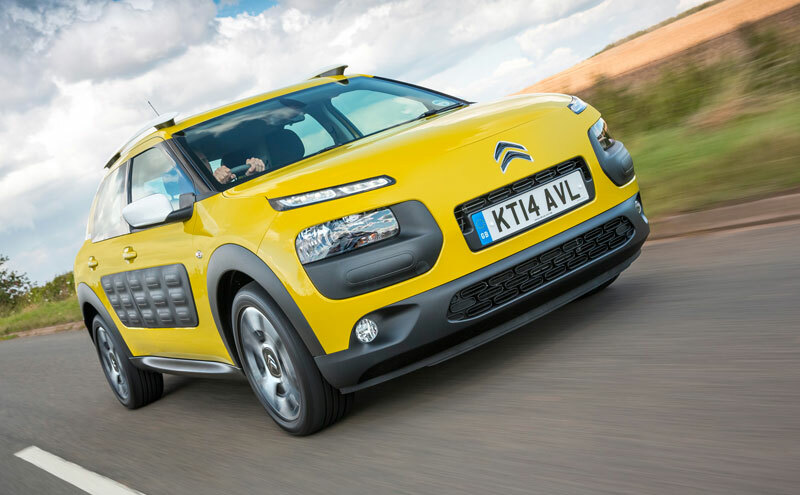 The Cactus’s easy-going nature extends to its handling, too, and while that means there’s more body-roll on offer than some drivers would like, really all it does is encourage you to take things easy. Once you fall into a more gentle rhythm, you’ll reap the benefits, with a compliant ride and nicely balanced controls that make the task of shuffling from one destination to another a remarkably soothing affair. 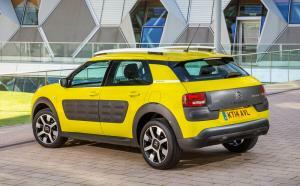 But then, that’s been Citroen’s aim for the Cactus – to create something that takes the stress out of everyday driving. Not just in the way it drives, but in its practical approach to modern life, from its Airbumps that shrug off the worst abuse a supermarket trolley can dish out, to the standard-fit reversing camera and even the option of a self-parking aid. 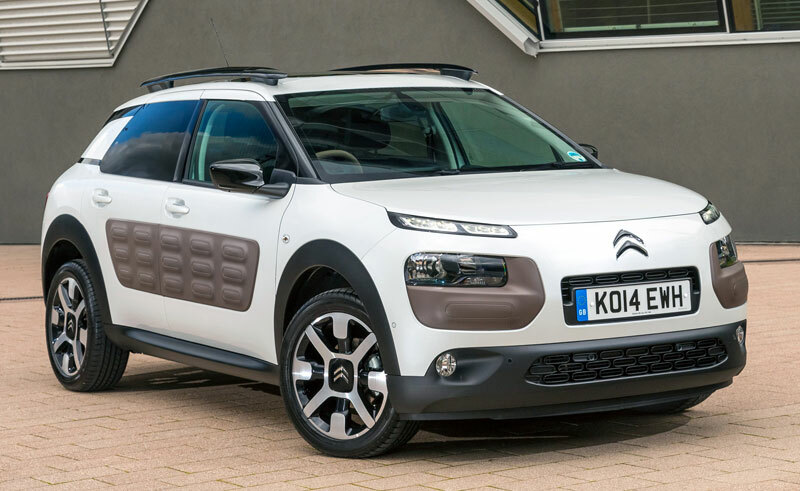 Offered in three trim levels – Touch, Feel and Flair – prices for the Cactus start at £12,990, with the Feel BlueHDi 100 likely to be the most popular at £16,590. Citroen’s most famous creation, the 2CV, was a design-led solution to a particular problem. While the Cactus can’t claim to be that car’s successor (and nor does Citroen make any such statement), there is a similarity to be drawn in the way the two cars came into existence. 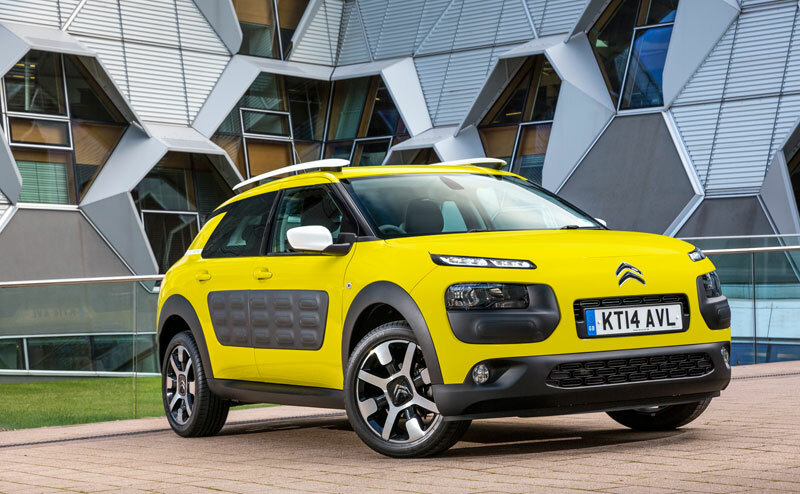 Someone inside Citroen stood up in a meeting and – with a straight face – suggested that the challenges posed by today’s maintenance-free roads and perpetually congested towns were best met by stapling bubble-wrap to the outside of a paired-down, jacked-up hatchback. Whoever it was, we salute them. 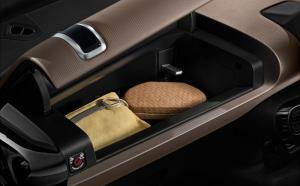 Because we think Citroen are really on to something here.